3D Touch or curved Edge screen? Metal or glass? LCD or AMOLED? iOS or Android? Speed and silky-smooth response or heavy-duty multitasking? These are the questions and no one’s got better answers than you. And if the answers consistently put you on this or that side of the line, you know all there is to know. Yet, Apple or Samsung? Having looked at each in depth, we know for sure that the side-by-side comparison will be even more exciting. No lengthy introductions needed, get ready for the spectacle. Even though it looks exactly like the one from last year, the Apple iPhone 6s Plus is a massive upgrade on the inside. It’s powered by a blazing fast A9 chip and delivers a long overdue camera upgrade on both sides. The pressure-aware display tech, faster Touch ID, and a tougher aluminum chassis complete their season’s tally. Samsung on the other hand, had a 6-month old device that wasn’t in desperate need of an upgrade. That’s what you’d think though while Samsung knew a phablet was due in time for Apple’s big release this year. The new S6 edge+ just got a bigger screen compared to the S6 edge – 5.7 inches of curved Quad HD AMOLED, and kept the hardware package intact: an Exynos 7420 powerhouse, a great 16MP camera, a plethora of sensors and superb design. So, Samsung or Apple? In the coming pages, this big question will be stripped of all intangible forces at play such as brand loyalty and investment in the ecosystem – and will boil down to the physical experience and aesthetic perception of metal, glass, screen and camera resolution, interface and design. We have a couple of fine phablets fully prepared for action. Two of the finest smartphones and cameraphones one can get if price is of no object. Let’s get to it, shall we? 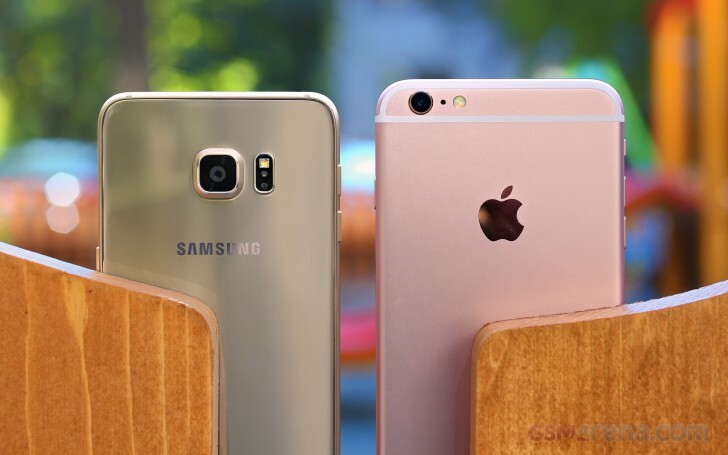 The iPhone 6s Plus is as big as the Galaxy S6 edge+. The Samsung’s flagship is thinner and comes with a bigger display. This means the iPhone 6S plus has bezel where the S6 edge+ has screen. The size comparison is clearly not in the iPhone’s favor. And there is more bad news. The iPhone 6s Plus has gained some extra weight at 192g, which makes it 40g heavier than the Galaxy S6 edge+. The extra layer of screen pressure sensors not only took a toll on the battery capacity but probably accounts for much of the added weight. The Apple iPhone 6s Plus has a familiar design, though its chassis is made of higher-grade Aluminum Series 7000, the same used on the Apple Watch. Even a year later though, most of the people find the subtly curved metal unibody quite attractive. It’s just the plastic strips covering the antennas that spoil the excellent impression. But you can have it in rose gold now. The Galaxy S6 edge+ design isn’t fresh off the board either. It’s been around for about half a year courtesy of the original Galaxy S6 edge. The curved display is great, the metal frame beautifully connects the rear glass with the front. There are no strips or interruptions of the seamless design. Samsung hasn’t yet jumped the rose/pink bandwagon and is sticking to its recent paintjobs, which still look great on the edge devices. The control set of both devices is kept to minimum – both iPhone 6s Plus and the Galaxy S6 edge+ offer discreet home keys, which double as fingerprint scanners. The second generation Touch ID is blazing fast compared to its predecessor, while the Galaxy edge+ is just a hair behind though its shape isn’t as comfy. Both flagships are big and single-handed operations are almost no-go. Samsung has a lot to offer with the Multi-Window feature running two apps side by side, while Apple’s only improvement is the double tap on home to bring the status bar closer. Let’s take a closer look now. The front of the iPhone 6s Plus features a new 5MP f/2.2 selfie snapper and the option to use the screen as a selfie flash. The S6 edge+ also comes with an even wider 5MP f/1.9 camera, which often produces better pictures. Flipping both phones around reveals the main camera sensors. Here Samsung’s offer has a huge advantage specs-wise – its 16MP Sony IMX240 sensor is much better than the 12MP Apple put on the iPhone 6s duo. It has much wider lens, more pixels and overall produces better pictures. Apple has an edge with the dual-LED true-tone flash though vs. a single-LED one on the S6 edge+. Taking a peek at the bottom of both models reveal a rather similar arrangement. The iPhone 6s Plus has a proprietary Lightning port, which might be more comfortable because of its reversible nature, but we’d prefer the Galaxy S6 edge+ microUSB standard connector because of its wider compatibility with accessories. And finally, handling those two gems is a real pleasure, but the iPhone 6s Plus is a lot slippery without a case on and this compromises the day-to-day handling. The Galaxy S6 edge+ isn’t much better, but its metal frame provides for a more secure grip. Winner: Samsung Galaxy S6 edge+. The Galaxy S6 edge+ looks are fresher and more innovative than the year-old iPhone 6s Plus design and it’s definitely the eye catcher of the two. Add to that the fact it has fitted a bigger screen in the same footprint and the fact it’s 40g lighter and you get the picture. Sure, the iPhone 6s Plus looks and feels premium, as it should, but it’s not as premium as a Galaxy S6 edge, not this year at least. Apple iPhone 6s Plus has an extra layer of pressure-aware sensors but other than that, the screen is the same as last year’s – a 5.5″ 1080p IPS panel of 401ppi density and an RGB matrix. Specs only tell you as much though as we can testify that when viewed at a steep angle the screen is noticeably better than last year’s iPhone 6 Plus. 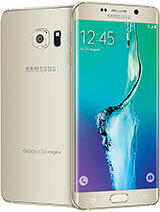 Samsung Galaxy S6 edge+ brings a bigger 5.7″ Super AMOLED display of Quad HD resolution. The pixel density is lower than the original edge model at 518ppi, but it’s still a lot higher than the one on the iPhone 6s Plus. Colors are a matter of taste and Samsung gives you an option of multiple screen modes that adjust both saturation and the white balance. The contrast ratio is exceptional due to the deep blacks. Samsung has maintained their partnership with Corning (those two have a joint venture) and uses Gorilla Glass 4 on both sides. While the Super AMOLED screen has the deepest blacks possible, the iPhone 6s Plus measurements are show its LCD unit is spectacular for an LCD too. 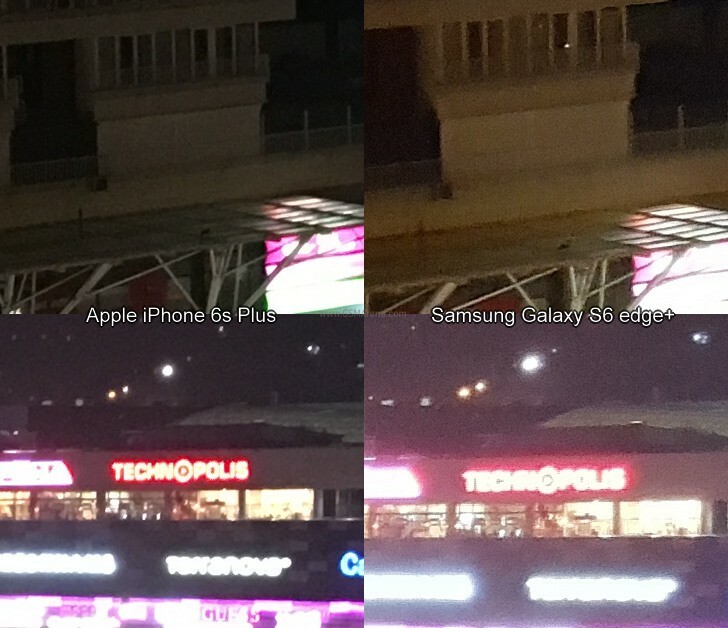 It also has higher maximum brightness than the S6 edge+, though the maximum auto brightness (usually used under bright sunlight) of the Samsung’s flagship can go as high as the iPhone’s screen. The AMOLED contrast is absolutely great, but the iPhone 6s Plus IPS display offers one of the best contrast ratios in its class. So, when it comes to these numbers, the iPhone is often brighter, while the S6 edge+ has an edge in displaying the blacks and the overall contrast. Maximum brightness is usually only used in broad daylight and it turns out the Galaxy S6 edge+ doesn’t need all that brightness. In our sunlight legibility test it showed an impressive result, the second-best we’ve seen to date. The Apple iPhone 6s Plus is still among the best performers we’ve seen, a lot better than its predecessor and it will serve you great even in the brightest of days. Winner: Samsung Galaxy S6 edge+. We wish there was more than a clash of screen specs but it’s not – the S6 edge+ has a bigger display, with higher resolution and higher pixel density. Its contrast and sunlight legibility are better, too. And we really appreciate the flexibility of having different display modes, which Apple doesn’t offer. Apple’s 1080p display is nothing short of top notch, with one of the best contrast ratio and sunlight performances in the class, it’s just not as good as a Quad HD AMOLED display by Samsung. With 2G and 3G connectivity practically maxed out on both devices, it’s the LTE that matters. The Galaxy S6 edge+ maxes out the LTE with Cat.9 support with up to 450Mbps downlink. The iPhone 6s Plus offers LTE Cat.6 with download speeds up to 300Mbps. The iPhone 6s models cover a lot more LTE bands worldwide than the Galaxy S6 edge+ though. The Apple iPhone 6s Plus also supports HD Voice as well as Voice-over-LTE (VoLTE). There’s HD Voice support on the Galaxy S6 edge+ as well, but for both handsets you’ll need carrier support for the feature to work. In terms of local connectivity, both devices can use the latest Wi-Fi 802.11ac standard, if you have the router for it. Otherwise it’s dual-band a/b/g/n. The Galaxy S6 edge+ supports Wi-Fi Direct (and Samsung’s similar alternative) for sending files between devices, while Apple uses its proprietary Air Drop system to exchange files between Apple devices (quite limiting indeed). For Bluetooth both the iPhone and the Galaxy supports the latest v4.2 standard, and both support the Low Energy mode. That mode is used for wearables – smartwatches, sport bands, etc. – but the Samsung Galaxy S6 edge+ also offers ANT+ for wider support of third-party sports accessories. Wired connectivity is handled by USB 2.0 but with different connectors. Samsung uses a standard microUSB 2.0 port with MHL support, while Apple sticks to its proprietary Lightning adapter (which is more user-friendly as it’s reversible). Both ports can be connected to an HDMI cable via an adapter, though Lightning seems limited to 1080p, while MHL will get out full UHD TV resolution. How else are you going to watch those 2160p videos you shot? Well, wireless Miracast is an option, which works with Smart TVs, Chromecast (and similar) sticks and the new Android TV. The iPhone 6s Plus can do wireless screen mirroring too, but only if you have an Apple TV hooked to your HDTV. Winner: Samsung Galaxy S6 edge+. Several small wins secure the victory: the 450Mbps LTE option (if your carrier even supports it), full NFC, 2160p video over MHL, ANT+. You can dismiss each individually as something you won’t use, but things pile up. The Apple iPhone 6s Plus covers pretty much every LTE band you will ever need plus CDMA, so if you are a worldwide traveler then it’s definitely the right choice. This year’s Apple had to trim down the battery of both iPhones in order to keep the footprint the same and yet put a new screen technology inside. The new Apple iPhone 6s Plus is powered by a 2,750mAh battery, a downgrade from the 2,915mAh unit inside the original 6 Plus model. The Galaxy S6 edge+ has a beefy 3,000mAh battery unit, but it has a bigger, higher-resolution screen. Sure, it’s an AMOLED unit, but it can still affect the overall battery life. Anyway, our battery test shows a minor 2.5% difference in the Endurance rating – the Apple iPhone 6s Plus gets 85 hours, while the Galaxy S6 edge+ scores 83 hours. 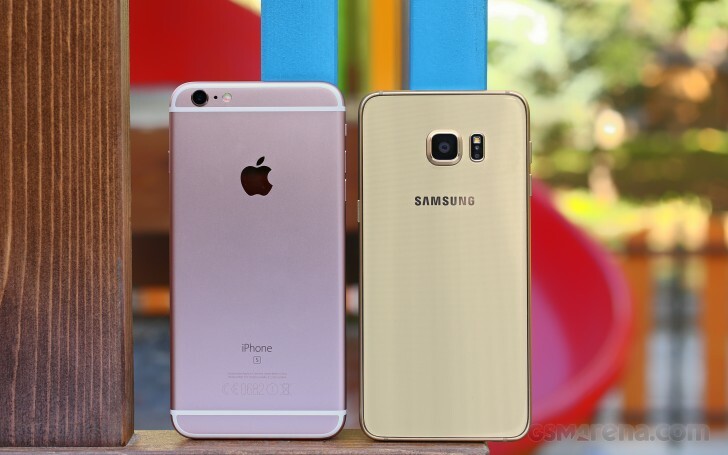 The Galaxy S6 edge+ offers double the talk time of the iPhone 6s Plus. The web browsing and video playback battery scores are in favor of the iPhone 6s Plus, but with only a minor lead, if any. And here are the video playback battery scores. In the end, it’s the iOS’ efficient standby that allows the iPhone 6s Plus to remain this close to the Galaxy S6 edge+. Android has more lax multitasking rules, which enables plenty of (often helpful) background services to run as much as they need but that does have an impact on battery life. Perhaps battery life in a mixed use scenario would be quite comparable on the two phones, but the Galaxy S6 edge+ will have an advantage if you tend to do a lot of talking. The endurance rating assumes using the phone for one hour of talking, web browsing and video watching per day. Such usage pattern is of course entirely artificial, but we’ve established it so our battery results are comparable across devices. Our proprietary score also includes a standby battery draw test, which is not featured in our battery test scorecard but is calculated in the total endurance rating. Our battery testing procedure is described in detail in case you want to learn more about it. Winner: Tie. Both devices offer similar video playback and web browsing skills. While the iPhone can’t last as much as the Galaxy S6 edge+ on 3G talks, it’s the better standby performer. And that’s why both phablets got an equal rating in our proprietary battery life test. Apple iOS and Android used to be very different beasts but over the years they have borrowed from each other and from other OSes so much that they function in more or less the same way. Of course, iOS is purely an Apple creation, while the OS that runs on the Galaxy S6 edge+ is heavily influenced by Samsung but primarily developed by Google. As of the time of writing this, the Galaxy S6 edge+ runs Android 5.1.1 Lollipop dressed with the latest TouchWiz on top. The iPhone 6s Plus launched with iOS 9 and you can already download v9.0.2. This is the advantage of Apple developing software for Apple devices – updates are lightning-fast. The two devices start in pretty much the same place – a lockscreen with time and date, plus a camera shortcut. The latest iOS and Android allows for push notifications on the lockscreen. Simple unlock methods can be used but what both companies will have you use is the fingerprint reader. It’s a fairly secure way to lock your device, that’s actually quicker than the various PIN and pattern locks. The iPhone’s new Touch ID is a bit faster and more comfortable. Samsung does offer a cool extra feature here called Private mode. It hides a folder where you can stash sensitive files, and the folder can only be accessed with your fingerprint. Samsung also offers Smart Lock, which disables the secure locking options when a trusted device is connected (Bluetooth smartwatch or car stereo or an NFC sticker) or when the phone is in a trusted location. Unfortunately, that’s determined by geo-positioning only, you can’t add a trusted Wi-Fi network. Samsung Galaxy S6 edge+ supports themes unlike the vanilla iOS. Themes can change the wallpaper and icons, core apps such as dialer, contacts, and messages, as well as the notification area. The two platforms differ in where the widgets go – Android puts them on the homescreen, while iOS stuffs them in the notification area. Apple supports landscape view on the iPhone 6s Plus, while the Galaxy S6 edge+ keeps its homescreen portrait-only. Samsung has enriched the homescreen with a Flipboard-powered My Magazine screen called Briefing, where you get both news and social networking updates. Apple on the other hand only has their News app, but it’s only available in the States for now. Samsung’s notification area may not have widgets, but it’s still pretty busy. There’s a scrollable row of quick toggles (which can be rearranged), followed by a brightness slider (which can be hidden), two buttons and only then the actual notifications. Apple has placed its quick toggles in a different slide-out menu, one which is pulled from the bottom. The so-called Control Center has four shortcuts too, but it’s not customizable like on TouchWiz. Third party apps appear on the Share with and Open with lists. One cool thing that Apple did for notifications is that they appear on the top row of the screen and you can tap them for a short interaction. The currently active app stays in place so you get back to it instantaneously. Samsung has a more PC-like approach to multitasking with the Multi-Window feature. It splits the sizeable Galaxy S6 edge+ screen in half so two apps can be used at the same time – there are certainly enough pixels and CPU power for that. Both multi-view and pop-up screen are activated from the App Switcher interface. Switching between actual apps on the Galaxy S6 edge+ is similar to the Lollipop experience where a 3D carousel of apps is shown. This lets you see only four apps at a time, for three of which you can actually see more than the app name. On the iPhone 6s Plus the app switcher is identical to that of the smaller iPhone and shows only three apps (one plus two halves, actually) in portrait mode and four apps in landscape mode. There are shortcuts to your favorite and recent contacts, which may be of some help too. Big screens are a boon, but also an inconvenience for one-handed use. The Galaxy S6 edge+ answer is to scale down the screen (which you can move and resize) to make sure you can reach everything. Even the hardware keys can be swapped for on-screen alternatives. Apple’s solution, Reachability, is more limited – you double tap the Home button (double tap, not double-press ), which lowers the UI half way down the screen. By Apple design, apps put the Back button (along with other controls) on the top row of the screen, which worked great for 3.5″-4″ screens but not so great on the 5.5″ iPhone 6s Plus. In the past year third-party apps have gradually transitioned to use a swipe-across-the-screen gesture to move back to previous screens. With booming storage options, sometimes it can be hard to find your files, which is where Spotlight comes in. It will search more than files though, it will go through Wikipedia, IMDb, assorted news sources and Apple stores (for apps, music, books and more). It has been updated and can now do simple calculations and conversions. It also supports finding sport scores and weather forecast information. And finally, you get shortcuts for making a call or sending a message to any of the contact results in the Spotlight searches. A similar functionality is offered by Samsung’s S Finder. The results list files, installed apps, contacts, settings and you can do a Google search, but that’s an extra tap. Of course, you don’t have to type, both phones have digital assistants, which understand spoken requests. Apple’s Siri has been gaining new skills with every new release of iOS – it can now search through your photos and videos based on dates, locations and the album names. It supports custom reminders from things you’ve been searching for in Safari, Mail, Notes and Messages and it got support for public transit navigation too. It also does song recognition, but you can also make it do a web search, turn off Wi-Fi or increase the brightness, Siri can even help you with booking a restaurant. Siri’s conversational skills are not bad either, it can answer questions about games, teams, players, movies, actors and more. S Voice is less chatty but it can handle commands too, like calling someone, playing a track or launching an app. It can take down notes or schedule an event in the calendar, even type up your SMS for you or answer trivia questions. One of the coolest features in the iOS is called Continuity. It makes the transition between Apple devices seamless – you can start typing an SMS on your iPhone and finish it on your MacBook. Or you could be reading a web page on your Mac and continue on your iPhone 6s Plus if you have to leave. This syncing works for other apps too, including Mail, Pages, Numbers, Keynote and Maps. While not quite as polished, Samsung SideSync offers similar functionality but in very a different way. It lets you use your computers keyboard and mouse to interact with your Galaxy smartphone, including text copy and paste, even moving files between the devices. You can mirror the phone’s screen on the computer and operate with it remotely. Winner: Samsung Galaxy S6 edge+. Phablet interfaces is something Samsung has been working on for generations before the S6 edge+ and TouchWiz is quite versed in this respect- you can have multiple apps, floating apps or maybe just shrink the screen temporarily. The Private mode is a great addition too. Apple did enable landscape mode and Reachability, but overall it’s like using a stretched out version of the iOS interface you get on a 4″ iPhone 5s. Siri is the better digital assistant of the two but we don’t put much weight on this as a feature. The support for 3D Touch on the Apple iPhone 6s Plus allows for another level of interaction, press the screen for a bit longer (and harder). This gets you access to extra actions and contextual options and we can’t wait to see how say, game developers put that to use in the months to come. Currently 3D Touch gestures are available only on selected system app. You can use it on the lockscreen, the homescreen and within apps. We already talked about the lockscreen gimmick, let’s see what it does on the homescreen. Force pressing on a supported app icon pops up a balloon. For example the Messages app gives you a New Message shortcut and a short list of your most recent messaging contacts. Force clicking on the Phone app gives you a – Create New Contact key and a short list of recently contacted people. Continuing on Safari – you get Show Reading List, Bookmark list, New Private tab and New tab; Mail offers shortcuts to Inbox, VIP, New message and Search; Music has Play Beats; and Notes – New Note, New Sketch and New Photo note. As you can see those force taps on the homescreen are indeed useful sometimes, but are hardly something you can’t live without. What really matters is what you can do within the apps with 3D Touch. 3D Touch is meant to allow you to get more content than you normally get on a screen, so that you can give it a quick glance and let it go – all of this with just one firm long press. If you press hard on an email within the Mail app, first it will be selected by blurring all the others. Applying slightly more force will pop its contents into a balloon for you to see it. Here you can either apply more force to open the whole email, or release your finger thus you’ll be back on the email list. This logic of opening content in balloons and eventually discarding or expanding it works on quite a few apps such as Photos, Messages, Notes, Calendar (events). It works in Safari as well – just hit a link firmly and you get a pop up with the linked page and if you like what you see you can press harder to open it, or just release it for discarding. Finally, one of the most meaningful uses of the Force Touch is selecting text. If you do a standard tap and hold on text you’ll begin scrolling through the words. And when you apply force to activate the Force Touch, you begin text selection from this very moment. This eases the entire text selection process tremendously – just scroll to your desired place and force touch from there and continue scrolling until you’re done. That’s basically all of it at the moment – it’s not much and certainly most of the functionality feels, if you pardon the pun, forced rather than intuitive and helpful. However, we get the feeling that Apple is simply trying to give hints to developers with those. Those are just ideas with the hope that developers will actually pick it up and will put the feature to great use in their apps. Just like its more compact relative, Samsung Galaxy S6 edge+ offers the cool Edge screen functionality. One of the highlight modes is the so-called Night clock. It shows the time and date on one of the edge strips during the night (or for any interval of the day you choose, but up to 12 hours). You don’t need to do anything to wake this strip up – it’s always on. People edge, another proprietary feature, is really cool as well – when you have missed notifications from one of your favorite contacts, you will get a tab of their respective color on the side of the edge. You just need to drag it to the left to see what it’s about. You can choose the edge strip position – there is no scenario where you can use both edges for notifications. The exact area to swipe for access to the edge strip can also be tweaked on the large screen of the S6 edge+. What does add more fuel to the 3D Touch fire is that other manufacturers began announcing phones with similar tech shortly before Apple’s event, so there will be more companies that want to see it succeed and in turn more developers willing to give it a proper consideration. We can’t say the same for the edged display though, which looks more like a gimmick rather than a technology breakthrough. Apple A9 is one of the best chips on the market today, but so is the Exynos 7420. The best way to check which one is better is to run some synthetic benchmarks and see what happens. Apple has always focused on the single-core performance since it is the most important one when it comes to interacting with the iOS user interface and early tests showed that the 64-bit Twister core is the best and fastest CPU core currently on the market. On the other hand you are only getting two of those, so we’ll see how it goes. In come the benchmarks. AnTuTu 5 painted the exact same picture. The Galaxy S6 edge+ posted a score very close to the 70,000 points range – just like its smaller relatives and better than any of their Snapdragon-equipped competitors. The A9-powered iPhone is behind, but still better than any other S810-device. The compound BaseMark OS II 2.0 test gauges CPU, GPU, Memory, Web and System performance. In this test there is no one to come even close to the iPhone 6s Plus thanks to Apple’s optimized OS. The fact that it has the latest A9 chipset doesn’t hurt either. Next – graphics performance. The new iPhone generation utilizes the six-core PowerVR GT7600 GPU, which is quite the beast. The Galaxy S6 edge+ relies on a Mali-T760MP8 octa-core GPU, but it has to handle four-times the pixels. The on-screen tests are rather predictable, as the iPhone 6s Plus runs on a 1080p resolution, while the Galaxy S6 edge+ displays everything at Quad HD. The off-screen benchmarks is where we can actually check the raw performance of the two GPU. Once again though, the PowerVR GT7600 is an absolute ruler of our charts. Finally, Android uses OpenGL ES 3.1 as its latest generation graphics API, while iOS 9 has the Metal API. Both allow games to make full use of the built-in GPUs and there are already several benchmark apps, which allow the cross-platform comparison of graphics-intensive apps. Combined with the lower resolution of the iPhone 6s, the Metal test really produces outstanding results. Winner: Apple iPhone 6s Plus: Apple A9 is a beast – there’s no other way to put it. The iPhone 6s Plus is not only the fastest iPhone to date, it’s probably the best performing smartphone too. Apple’s choice of designing its own processor and OS pays out every year and makes sure iOS users never have to worry about lackluster performance. The only test the iPhone 6s Plus is slightly behind the Galaxy S6 edge+ is the multi-core processor benchmark, which takes a toll on the AnTuTu performance, too. While the Samsung’s Exynos 7420 chipset is a flagship-grade and the best you can find in the Android ecosystem, the Apple’s A9 is the better performer in the majority of the tests. Apple updated the Photos app with iOS 9 with Live Photos and better search options by location and date. But what’s a Live Photo? It’s lets the camera shoot a 3-second video clip around the time you hit the shutter button to snap a photo. We’ve already seen a similar implementation on the HTC One and the Zoe feature and they are pretty neat making your memories come to life. Unfortunately, sharing them across platforms is quite hard. Other than that Photos app offers the same layout and interface we met for the first time in the iOS 8. Your pictures are organized by date and location, if available. The views you can switch between are Moments, Collections and Year – just like before. We already mentioned the 3D Touch support. It allows you to preview both standard photos and Live Photos in the gallery. It’s a pop-up with the picture and you can swipe it up for additional settings (Copy, Share, Delete). The integrated image editor is really powerful and could improve your photos a lot. You should try and play a bit with it, it’s among the best we’ve seen on a mobile device and while it may offer lots of manual tweaks, its automatic enhancement options are rather good, too. The familiar iCloud Photo Library, Shared Photo Streams (a mini social networks), and a dedicated Recently Deleted album are also available. The Galaxy S6 edge+ gallery’s default view shows photos grouped based on time. Thumbnails are shown on a clean white background and you can change their size with a pinch zoom gesture. Events uses time and location to group photos and automatically create “Video highlights,” a slideshow accompanied with music. You can export that to a video to share on your social network of choice. The Categories view groups multimedia by type – pictures, videos, slow-mo videos, Virtual shots and so on. The People category groups photos based on the faces in them. There’s also a Documents category. You can use the Search shortcut to look for photos based on category, people, time, event, location and so on. The iOS 9 music player looks a lot like the one from iOS 8 – it supports (ad-supported or ad-free) iTunes Radio and iTunes Match, as well as iCloud Music library. It syncs with your computer’s iTunes library, streams from your Match and/or iCloud songs, as well. But in case that is not enough, there’s also Apple Music now. The service can replace everything music-related feature Apple has launched to date and offer you pretty much the entire music world at the tip of your fingers. Basically Apple Music does what Google Music or any other similar service does – allows you to stream songs, add them to playlists, and build an entire music library in the cloud. You can also download those songs for offline usage and unlike Google Music, Apple Music allows you to download single songs from albums. Finally, the Beats 1 radio is available 24/7 and the tracks there are chosen by real DJs, not machine algorithms. Lots of people have been hooked on this idea already. Samsung’s TouchWiz music player used to be one of the most feature-bloated apps, but the company has done some work to trim the fat. The app looks very clean now, essentially it has just two screens. SoundAlive has gotten rid of the square view too, now it has two dials – one changes the balance between bass and treble, the other between instrumental and vocals. You can tap the Details button for a manual 7-band equalizer. Audiophiles should know 16-bit and 24-bit FLAC audio works out of the box. Adapt Sound is available to automatically tune the equalizer based on your headphones and your hearing. Additional options include SoundAlive+ (creates a surround sound effect) and Tube Amp. There’s also Smart volume to balance the volume between tracks and playback speed if you want to slow down or speed up the playback (useful for audio books we guess). One of the most important additions to the audio credentials of Samsung Galaxy Galaxy S6 edge+ is the UHQ Upscaler. Developed by Samsung, the feature enhances the “sound resolution” of music and video files for better experience with headphones. Google Music app is available on the Galaxy S6 edge+, so you can enjoy streaming and downloading music from Google’s library. Recently it was updated with smart suggestions to match the Apple’s Music feature. It lacks the Live radio and an option to download separate tracks from albums for offline listening though. The iOS video player actually has just few features. It heavily relies on iTunes as it supports only one video format and it needs the desktop app to convert videos to that. As we already mentioned in the Connectivity chapter, the Lightning port can output 1080p video via an adapter. Samsung again goes all out with the features and supports a good deal of formats. The audio codec support is pretty spotty though, typically nothing multichannel (AC3/DTS) will work. There’s extensive subtitle support and you can put the video in a popup to watch while you use another app. The MHL-enabled microUSB 2.0 port can output 2160p video with the right. Strangely, surround sound output is supported but you’ll have to resort to a third-party video player for that. Winner: Samsung Galaxy S6 edge+. We’re willing to call the gallery a draw (both have exciting exclusive features), but the music and video players go in favor of the Galaxy. The ease of use and of these applications and more importantly, adding multimedia content to the phone is as great as it gets. 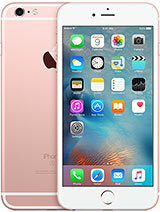 The Apple iPhone 6s Plus does well enough in Apple’s ecosystem – the iTunes Store sells properly encoded video and audio files, but bringing content from the outside world can be tricky and confusing for novice users (especially if your multimedia collection is not organized by the iTunes computer application). Both the iPhone 6s Plus and the Galaxy S6 edge+ have their speakers placed at the bottom, just around the connectivity port. While they offer rather adequate sound quality, their loudness is less than stellar. Both phones out similar results when it comes to music and voice loudness, but the ringing performance is louder on the Galaxy S6 edge+ and this makes it a winner in this category. Winner: Samsung Galaxy S6 edge+. The Samsung Galaxy S6 edge+ and the Apple iPhone 6s Plus are both excellent performers when it comes to using them as audio players. Both of them have nicely clean output and decent volume levels, meaning even audiophiles will be very pleased with either. The Galaxy S6 edge+ offers higher volume levels though and has an edge over the iPhone. The dynamic range of both devices is great, as is the frequency response. The Galaxy S6 edge+ does better with the stereo effect though as the iPhone has a higher inter-channel interference. Plugging a pair of headphones equalizes the stereo performance, while keeping the great dynamic range. The Galaxy offers better audio quality with the headphones in as it’s visible on the frequency response graph and it gets a deserved credit for it. Winner: Samsung Galaxy S6 edge+. It is louder, offers better stereo effect with an amplifier and better frequency response with headphones. Before we dive into image quality, we’d like to quickly list camera features for both devices. Both manufacturers claim Optical Stabilization, and both boast hybrid contrast detect – phase-detect autofocus. The Apple iPhone 6s Plus brings the long overdue camera resolution upgrade. After sticking to an 8MP sensor for four generations, Apple finally upgraded the iPhone’s main camera to a 12MP imager. The front camera has received an upgrade to 5MP as well. Both cameras are paired with a lens with the same F/2.2 aperture. The more powerful chipset and the new 12MP sensor allow the iPhone 6s Plus to capture 4K video recording among other new modes, plus it enables the so-called Live Photos. This is a familiar feature from the first HTC One – the camera captures 1.5s video either side of the moment you hit the shutter and it turns it into sort of animated photos. Apple also does 1080p@60fps but goes up to 240fps at 720p and up to 120fps at 1080p for the best slow-motion mode yet. The iPhone 6s Plus also has a dual-LED flash to rely on in the dark. Both devices offer HDR modes for stills and videos, as well as the panoramic shots. Samsung has opted to use the superb 16MP Sony IMX240 sensor on the Galaxy S6 edge+, coupled with f/1.9 lens. It’s a 16MP sensor with 16:9 aspect ratio that’s capable of 2160p@30fps video, plus 60fps and 120fps modes at 1080p and 720p respectively. That’s the same excellent setup that’s found in Samsung Galaxy S6 and Galaxy S6 edge with the addition of an IR white balance detection sensor, a feature we first saw implemented on the LG G4. LG calls this sensor Color Spectrum Sensor, but essentially both sensors do the same thing – they try to analyze the color spectrum of the available ambient light so that they deliver a more accurate color balance. 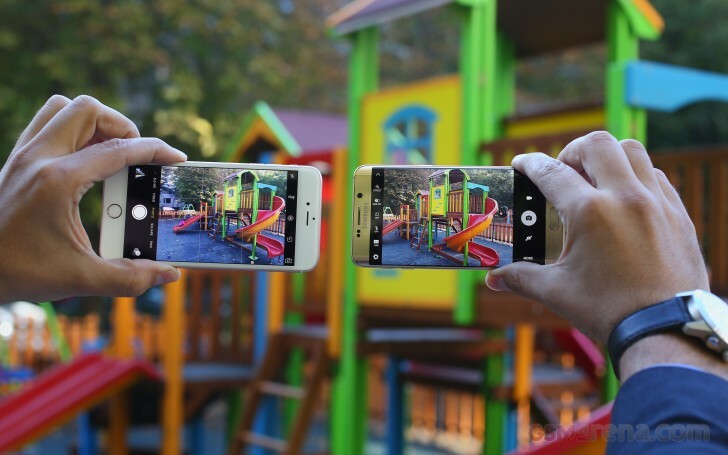 The Galaxy S6 edge+ is equipped with a 5MP front-facing camera, which has a similar F/1.9 aperture and offers Live HDR and color filters as well. The Apple iPhone 6s Plus doesn’t offer a plethora of features – AE/AF lock, geotagging and face detection are about it. Other options include turning Live Photo on/off and filters. By the way, the Apple iPhone 6s Plus can use its display for the so-called the Retina flash feature, which lights up the display at up to 3 times its usual maximum brightness to illuminate selfies in dark settings. It also tailors the tint to match the ambient light. It’s better than nothing and can save you in extreme cases, as long as you don’t expect miracles. Luckily, the App Store is full of advanced camera apps, including slow shutter speed, which will give you enough creativity if you need it. True to self, Samsung loaded plenty of features. The Selective focus (which has become trendy recently) lets you change the focus point after taking the photo, Virtual Shot is an upgrade over regular panoramas (it lets you walk around as you shoot), there is Pro mode where you can tweak all the settings by your choosing (focus distance, white balance, ISO up to 800, exposure and shutter speed up to 10s). Even RAW option is available. There are options for slow and fast motion videos, and live broadcast on YouTube. But wait, there is more. In case those are not enough for you, you can download additionally sport shot, sound & shoot (a.k.a. Live Photo), food shot, rear-cam selfie, dual camera shot, animated gif, among others. The onscreen interface is clean, but you can pop up Auto/On/Off HDR, flash and effects shortcuts. Samsung has provided focus/exposure lock too, as well as geotagging and face detection. The front 5MP selfie cam has a 120-degree WideSelfie mode, so it can easily capture group selfies. You can snap selfies with a tap on the heart-rate sensor on the back of the phone. 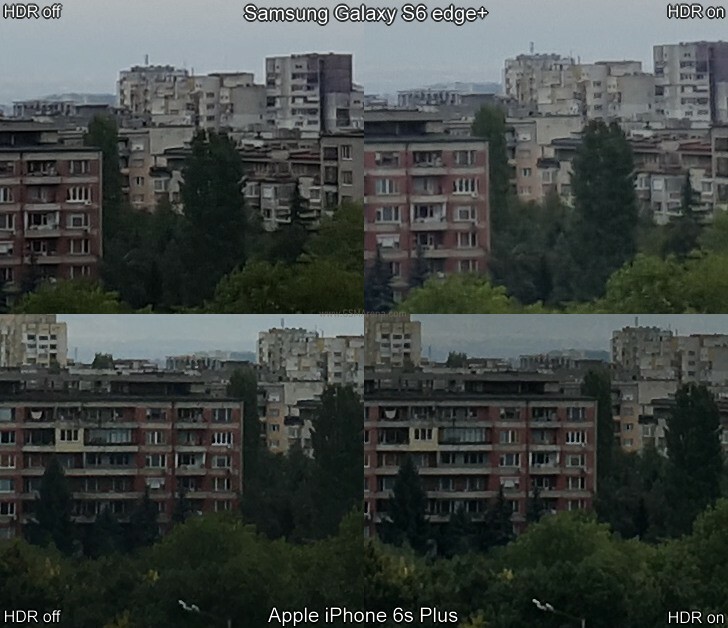 Samsung Galaxy S6 edge+ has a wider Field of View (FoV) due to its 16:9 native sensor. It captures 16MP images at 5312 x 2988, while the iPhone 6s Plus snaps 12MP stills at 4032 x 3024. An iPhone image fits almost perfectly at the center of the 16:9 still taken with the Galaxy S6 edge+. The higher resolution is easy to see in the level of captured detail – the STOP sign is clearly legible in the Galaxy S6 edge+ photo and the foliage looks better. The bars on the bottom picture are better resolved, there is less noise and less to none compression traces. This crop also makes it easier to compare color rendering – the iPhone 6s Plus has a blue-ish tint, while the Samsung has a slight yellow overcast. The warmer colors on the Galaxy S6 edge+ are somewhat closer to the reality than the iPhone 6s Plus, yet this is a rather personal taste, so we can’t easily rule for either of the phones. And here is another crop to illustrate the better foliage and the more detail on the Galaxy S6 edge+ images. Both cameras keep noise down, though the Galaxy has a better success. Both snappers offer excellent dynamic range though and we found ourselves barely using the auto or manual HDR option. Here are the full resolution samples. And here are two 5MP selfie shots taken with the front cameras. While nothing impressive, the Galaxy S6 edge+ front camera is wider, resolves more detail and the colors and contrast are slightly better. We also snapped some low-light selfies with both devices. If the so-called Retina flash is turned on, the iPhone 6s Plus succeeds in resolving more detail and produces less noise. The backgrounds go darker with the Retina flash, but that’s to be expected. It seems Apple was right to use the screen as a flash, as it indeed helps to improve the overall quality. Winner: Samsung Galaxy S6 edge+. A 16:9 camera is a better match for modern screens (phones, tablets, laptops, TVs, almost everything is widescreen), but more importantly the Galaxy S6 edge+ photos offer a significant advantage when it comes to resolved detail and less noise. The Apple iPhone 6s Plus takes good-looking photos, but it loses on the most important factor (resolved detail) and offers no tangible advantage in other aspects. Dynamic range is another important quality of a good photo and we’ve already established both devices offer great dynamic range. Still, if you need to use HDR the Apple iPhone 6s Plus photos are a lot noisier and darker, though they manage to extract more detail in the shadows than the regular photos. The Galaxy S6 edge+ manages to resolve more detail in both the highlights and the shadows, the noise levels are kept low as well. The images are brighter, with better contrast and exposure. Check the full resolution samples below. Winner: Samsung Galaxy S6 edge+. While both phones do great when you leave the HDR option at auto, the HDR photos are a lot better on the Galaxy S6 edge+. The iPhone 6s Plus, thanks to the bigger sensor, offers even bigger panoramic images. Those still cover about 180-degrees, but now they can go up to 15,000 x 4,000 pixels or 60MP. The stitching is great, there are no artefacts, the dynamic range is amazing, and the color rendering is good, too. 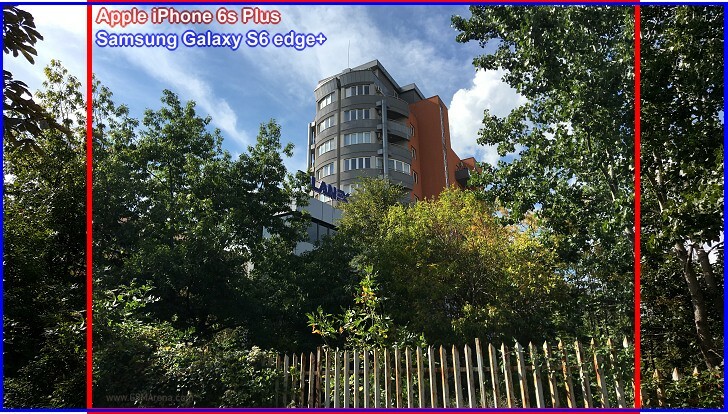 The Samsung Galaxy S6 edge+ shoots panoramas with very high resolution – 3,200px tall if you hold the phone upright, 1,800px if you hold it on its side. The software and the fast chipset make shooting very simple, you just start panning in one direction. The 360-degrees panoramic images are also up to 60MP resolution at about 19,200 x 3,100 pixels. Both phones produce amazing panoramic shots, the best you can find on the market. The iPhone’s samples are noisier and smoother, while the Galaxy makes them sharper and with less noise. The dynamic range is superb on both sides, as are the colors and contrast. Winner: Tie. The iPhone 6s Plus is limited to ‘just’ 180-degree pano shots, but those are the same resolution the Galaxy S6 edge+ needs to render a 360-degree pano. The Galaxy though offers slightly better detail and less noise. Finally, the iPhone 6s Plus offers a whisker better dynamic range over the otherwise great S6 edge+. Now that the iPhone 6s Plus can record 4K videos, it is finally on par with the competitions. So, it’s easier to compare the available modes. Really, Apple, is that hard? Since the iPhone 6s Plus, the most powerful smartphone on the market, comes with two microphones, we can’t fathom why Apple isn’t enabling the stereo sound. We guess it needs to be reinvented in a proper way, hopefully in a year or two. Or ten. Apple’s 4K videos carry a bitrate of around 51Mbps, the 1080p videos at 30 fps have a bitrate of 17.6 Mbps, keeping the same audio, while the 60fps ones came out with 26Mbps bitrate. Samsung’s 2160p videos are shot at the usual 48Mpbs total bitrate, the 1080p videos at 30 fps have a bitrate of 17.1 Mbps, keeping the same audio, while the 60fps ones came out with 28Mbps bitrate. The 4K videos shot with the iPhone are slightly less processed than its still images – there is some noise, but less over-sharpening while the detail is decent if not quite class leading. Dynamic range is once again impressive and the frame rate is pretty steady, but the mono audio is disappointing. The Galaxy S6 edge+ 4K videos also offer great dynamic range, though notch lesser than the iPhone’s. They offer more detail, less noise and better sharpness though. The colors on the iPhone are warmer, while the Galaxy’s are more accurate and close to reality. Here is a crop from 4K videos shot side by side. Note that the Galaxy video is a bit overexposed, but this isn’t a common issue. The same findings apply for the 1080p videos – decent amount of detail, high dynamic range and superb contrast. While both phones do great on the 1080p capturing as stand alones, a side by side comparison reveals the Galaxy S6 edge+ videos have more detail and are much sharper. Both cameras boast Optical Image Stabilization, but Apple has decided to keep its digital stabilization active. It’s one of the best around, but it narrows the FoV and shouldn’t be needed on an OIS camera. The OIS/digital stabilization combo seems to have worked for the iPhone 6s Plus, it absorbs the shake of footsteps better and its video appears to float smoothly. The Galaxy S6 edge+ corrects small shakes okay, but there’s jerkiness left uncorrected. The Apple iPhone 6s Plus has a dual-LED flash, which should give it an edge over the Galaxy S6 edge+, which packs a single LED. But for the first tests we forced the flash off – smartphone flashes are good at close range only and oftentimes it’s all up to the camera sensor. With OIS on, both cameras can afford to drop the shutter speed quite low, something that’s good for static scenes and not so much for action shots. Here the iPhone 6s Plus went all the way down to 1/4s, but that allowed it to keep ISO at a low 125. The Galaxy S6 edge+ shot at 1/11s, but needed a higher ISO of 400. 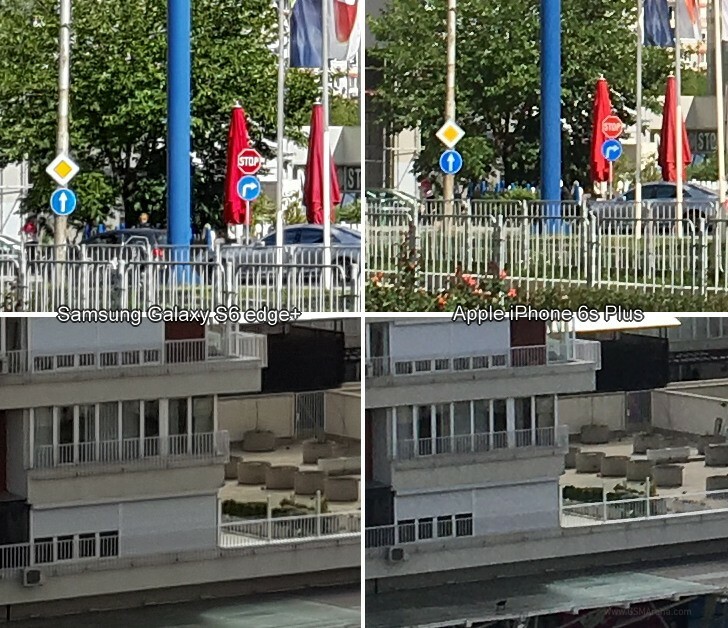 The results are pretty clear – the iPhone 6s Plus produced a detailed image with low noise and good colors. The Galaxy S6 edge+ image was noisier and the white balance is a bit off. Both phones perform fairly consistently when it comes to photos. Again, slow shutter speeds don’t work well if there’s movement in the scene. Now the flash test. We enabled the flash and the iPhone 6Ñ Plus went up to 1/17s shutter speed, while keeping the ISO at 125. The Galaxy S6 edge+ again chose a faster shutter speed, 1/24s, and dropped the ISO to 200. Unfortunately the iPhone 6s Plus white balance is off and the image has a green tint. We’d expected the iPhone’s dual-tone dual-LED flash to do better than the single-LED flash on the Galaxy S6 edge+, but we were wrong. The only thing the iPhone did better is to keep some of the detail in the background. The Galaxy’s processing is much better, as is the resolved detail, white balance and color rendering. About 93% of our readers thought the same. Those are the full-res samples. Winner: Tie. The iPhone 6s Plus often messes the flash photos, but still does better when it comes to low-light scenery. On the other hand, even with a single-LED flash the Galaxy S6 edge+ will give you better images indoors. The Apple iPhone 6s Plus can’t pull the slow shutter speed trick in video and predictably quality suffers. This gives the Samsung Galaxy Note 4 a face-saving opportunity. 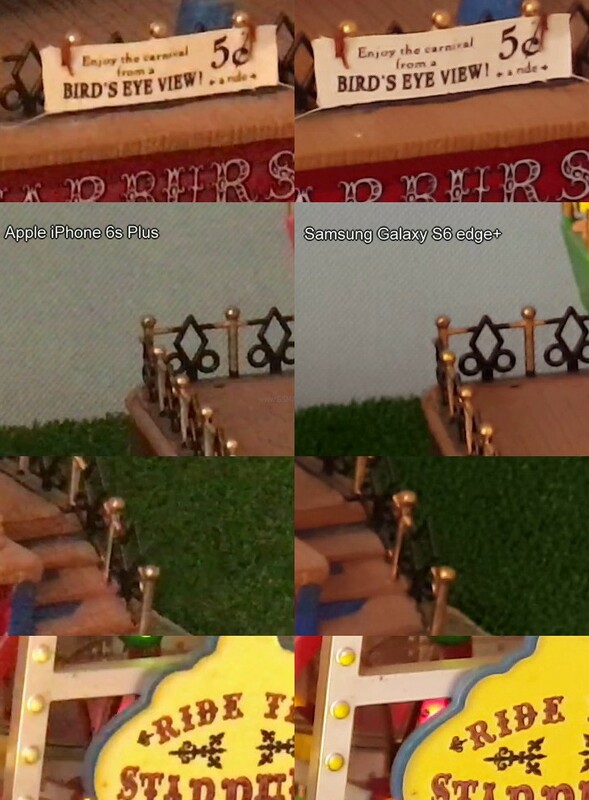 The iPhone videos are noticeably noisier (complete with color noise) and appear softer. The 1080p videos on the Galaxy S6 edge+ are even better with more detail, while the iPhone is quite behind with less detail, more noise and even compression artefacts. Winner: Samsung Galaxy S6 edge+. It outs better videos shot in the dark in both 2160p and 1080p resolutions. If we are to keep score, then the Apple iPhone 6s Plus would be in a terrible position – it won three of sixteen tests, tying in just two of them. Yet those three chapters make the iPhone the most powerful smartphone in the world to date, with excellent optical image stabilization and a great piece of novelty in the pressure-sensitive screen layer. The two challenges it tied with the Samsung phone are battery life and low-light performance – another couple of essential skills a lot of people are looking for. Then again, the Galaxy S6 edge+ can match and best Apple’s design and has a superior QHD AMOLED display, richer software and multimedia packages, does better at still photos and video recording and has the better audio. The connectivity options, except the LTE band coverage, are superior as well. 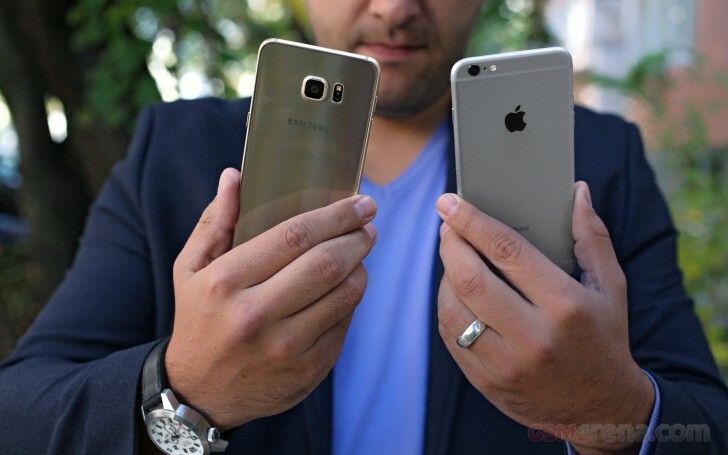 These two are phablets by the way, a form factor typically embraced by Android users, less so Apple’s. We guess the iPhone 6s Plus will be a slightly less popular choice than the regular iPhone 6s – and may not sell as much as what’s probably the top Android specimen. Yet, the competition of other Android OEMs is not to be underestimated. The Nexus line and Sony are the most likely rivals to hurt the Samsung Galaxy S6 edge+ sales. The upcoming Lumia flagships are perfectly capable of making it even more complicated for both Apple and Samsung. Ultimately, this is a game that’s decided at the box office. Apple and Samsung have no trouble selling their stuff. They actually do better than most. Yet, the best-selling device is not necessarily the best device and that’s what phones have in common with movies, books, games, anything. 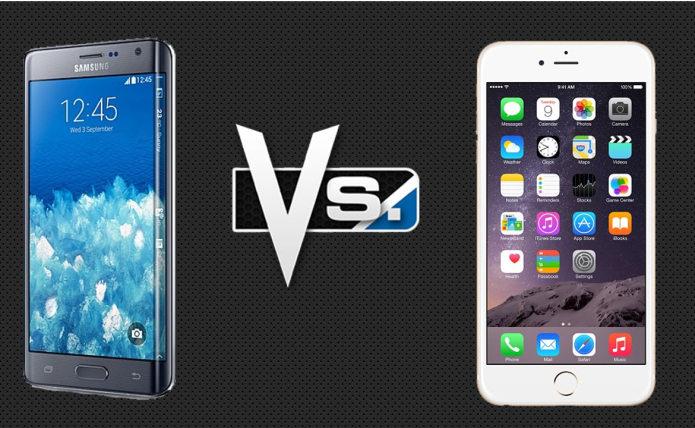 Funny, the iPhone 6s Plus and the Samsung Galaxy S6 edge+ are probably two of the best phones to get right now. Two amazing pieces of technology but pretty much incapable of changing anyone’s mind. Both devices are really trying: Samsung is no longer putting function before aesthetics and has given up traditional advantages such as memory expansion and a removable battery. Apple too has broken a long-standing taboo – large screens. You know, this may let them steal some users from each other but the decision to go Samsung or Apple, iOS or Android, was in most cases taken once upon a time, maybe even before the Samsung Galaxy S or the iPhone 3GS. So, if anyone tells you go this way or that there is a good chance they are right, and wrong.